Package contents are any products, aside from accommodation, that you want to include as part of a package's offering. They can be default items that are included as part of the base package, or an optional or alternative item that can be added in addition to or as a substitute for any default items. Default: a default single item can not be deselected from inclusion in your package by your customer. Option: an optional single item is a product that your customer can add to their package if they want to. It's an opportunity for you to up-sell additional activities, services, items, etc. Group items differ slightly from single items in that they give your customer an selection of options to choose from. For example, this could be beginner, intermediate and advanced surf lessons. By having the three options presented in a group your customer will be able to take their pick. 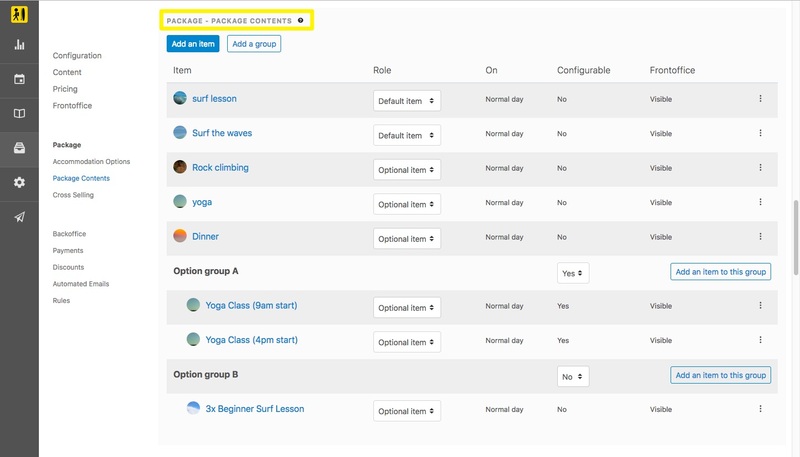 Default/Alternative Groups: this is a group where the default item is preselected and the price is included within the base price of the package, but there is also an option to be able to select a different item. If there is a price difference between the two items then this is displayed next to the alternative item. Option Groups: this is a group of optional items where your customer can choose one or none of the items presented. For example, below you can see that in the Frontoffice two items are presented as options but on initial pageload neither are selected. Selecting one item when the other item is selected will deselect the first item. How Can I Customise The Way Package Contents Are Displayed and Booked?